The innate immune system uses a variety of germline-encoded pattern-recognition receptors that recognize conserved microbial structures or pathogen-associated molecular patterns, such as those that occur in the bacterial cell-wall components peptidoglycan and lipopolysaccharide. Recent studies have highlighted the importance of Toll-like receptors (TLRs) as a family of pattern-recognition receptors in mammals that can discriminate between chemically diverse classes of microbial products. First identified on the basis of sequence similarity with the Drosophila protein Toll, TLRs are members of an ancient superfamily of proteins, which includes related proteins in invertebrates and plants. TLRs activate innate immune defense reactions, such as the release of inflammatory cytokines, but increasing evidence supports an additional critical role for TLRs in orchestrating the development of adaptive immune responses. The sequence similarity between the intracellular domains of the TLRs and the mammalian interleukin-1 and interleukin-18 cytokine receptors reflects the use of a common intracellular signal-transduction cascade triggered by these receptor classes. But more recent findings have demonstrated that there are in fact TLR-specific signaling pathways and cellular responses. Thus, TLRs function as sentinels of the mammalian immune system that can discriminate between diverse pathogen-associated molecular patterns and then elicit pathogen-specific cellular immune responses. The Drosophila genome contains nine genes that encode Toll and related receptors (dToll1 - dToll9), whereas ten Toll-like receptor (TLR) genes have been identified in mice and humans [1,2,3,4,5,6]. The human and murine TLR2 genes and the murine TLR4 gene have two 5' non-coding exons followed by a third coding exon. In contrast, the human TLR4 gene has an additional 5' non-coding exon . Gene-mapping studies have revealed that TLR genes are dispersed throughout the mammalian genome. Specifically, human TLR genes reside on chromosomes 4 (TLR1, TLR 2, TLR 3, TLR6 and TLR10), 9 (TLR4), 1 (TLR5), X (TLR7 and TLR8) and 3 (TLR9; see Figure 1). DNA sequence comparisons of genes encoding Toll-related proteins in Drosophila, reptiles, birds and in mammals have revealed that the genes are well conserved and have evolved independently from a common ancestor gene . Structural features of human members of the TLR protein family and the archetypal Drosophila Toll protein. Toll and its relatives are characterized by an amino-terminal extracellular leucine-rich repeat (LRR) domain, which is probably involved in ligand binding, and an intracellular Toll/interleukin-1 receptor (TIR) domain required for signal transduction. Known ligands of different TLRs and chromosomal locations of the human TLR genes are indicated. Red arrows indicate a possible dimerization between TLR1, TLR2 and TLR6. TLR9 is normally expressed intracellularly. Abbreviations: MALP-2, macrophage-activating lipopeptide-2; LAM, lipoarabinomannan; details of other ligands mentioned in the figure are discussed in the text. As shown in Figure 1, TLRs are a family of type I transmembrane receptors characterized by an extracellular amino terminus. They have an amino-terminal leucine-rich repeat (LRR) domain and a carboxy-terminal intracellular tail containing a conserved region called the Toll/interleukin-1 receptor (TIR) homology domain. The extracellular domain contains a varying number of LRR domains, which are presumably involved in ligand binding but may also be necessary for TLR dimerization. The extracellular domain of TLR4 is highly polymorphic compared with the transmembrane and proximal cytoplasmic domains of the protein . In addition, the extracellular domain of TLR4 contains an 82 amino-acid region that is highly variable and contributes to species-specific differences in recognition of lipopolysaccharide (LPS), the prototypic TLR4 ligand . The intracellular TIR domain region spans over 200 amino acids and itself contains three highly conserved regions . The TIR domain mediates protein-protein interactions between the TLRs and signal-transduction components (see the Signaling mechanism section); it is the defining motif of the TLR/interleukin-1 receptor superfamily, which includes the receptors for the cytokines interleukin (IL)-1 and IL-18 and is likely to be one of the earliest signaling domains to have evolved . A TIR-like motif is also present in several plant receptors that are known to confer disease resistance , including the N protein, which conveys resistance to the tobacco mosaic virus, or the L6 flax rust resistance protein. Although the IL-1 receptor and TLRs have very different extracellular domains, their TIR domains allow both receptor types to activate similar signal-transduction pathways. Consistent with their role in pathogen recognition, TLR family members are expressed by cells involved in the first line of host defense, including neutrophils, macrophages, dendritic cells, dermal endothelial cells and mucosal epithelial cells. TLR2 and TLR4, which are the major receptors for bacterial lipoproteins and LPS, respectively, are also expressed on B and T cells, which mediate the more complex adaptive immunity via a large repertoire of antigen-specific immunoglobulin-class receptors . With the exception of TLR9, which is an intracellular receptor, most TLRs are expressed on the cell surface. Interestingly, the subcellular localization of TLR4 has been shown to differ in macrophages and intestinal epithelial cells. In macrophages, TLR4 is expressed on the cell surface and is internalized following engagement of the ligand, whereas in epithelial cells it resides in the Golgi apparatus . 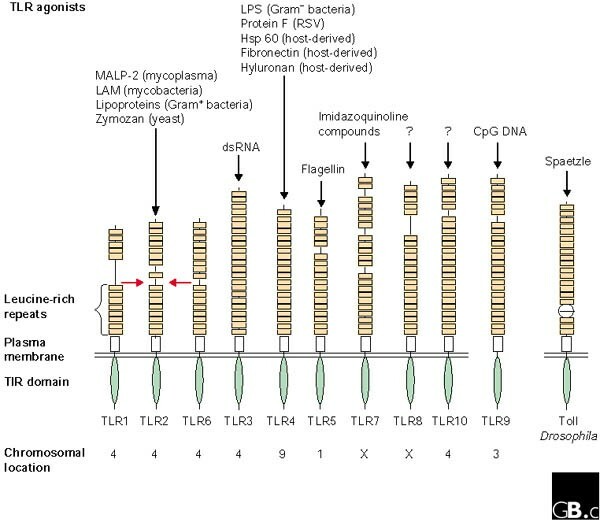 The first indication that TLRs may function as pattern-recognition receptors in mammals came from the discovery that the phenotype of lps mice, which do not show the systemic inflammatory response usually triggered by LPS, resulted from loss-of-function mutation in the TLR4 gene, thus establishing TLR4 as a receptor for the LPS of Gram-negative bacteria . Subsequent studies using TLR4 knockout mice corroborated this finding . Ex vivo studies, later confirmed by gene-knockout experiments, showed that there are additional agonists for TLRs. A variety of chemically diverse pathogen-associated molecular patterns are now known to be TLR agonists, as indicated in Figure 1. Studies using TLR2 and TLR4 knockout mice have revealed that these receptors mediate cellular responses to cell-wall components of Gram-positive and Gram-negative bacteria, respectively . These components include LPS, other bacterial glycolipids, peptidoglycan, and bacterial lipoproteins. TLR4 has also been implicated in the recognition of coat proteins (for example, protein F) of the respiratory syncytial virus (RSV), which is a major cause of bronchiolitis in infants . TLR3, TLR5 and TLR9 have been implicated in the recognition of viral double-stranded RNA, bacterial flagellin and bacterial CpG DNA, respectively [18,19,20]. Recently, TLR7 was shown to be involved in cellular activation by small anti-viral compounds, including imidazoquinoline compounds, although the natural ligand for this receptor remains unknown . In addition to their role in pathogen recognition, recent evidence suggests that some TLRs respond to endogenous factors produced by stressed or damaged cells. These factors include heat-shock proteins (Hsps) [22,23,24], fragmentation products of the extracellular matrix components fibronectin and hyaluronan [25,26], and mammalian chromatin . The putative capacity of TLRs to heterodimerize may explain, at least in part, how TLRs are capable of recognizing so many chemically diverse agonists. Little is known about how microbial products activate TLRs. In Drosophila, Toll does not directly bind microbial products, but instead binds a proteolytic fragment of the secreted growth factor Spaetzle. The current view is that microbial antigens interact with a yet unidentified recognition receptor upstream of Toll to activate zymogens in the fly's hemolymph, ultimately leading to cleavage of Spaetzle to its active Toll ligand form . In contrast, TLR4-dependent recognition of LPS by mammalian cells requires two accessory proteins: the high-affinity LPS acceptor protein CD14, a glycosylphosphatidylinositol (GPI)-anchored protein, and the small secreted protein MD2, which associates with the extracellular domain of TLR4 [28,29,30]. Physical contact between LPS and TLR4 was recently demonstrated [31,32], but to date, there is no evidence for direct ligand binding and recognition for all other TLRs. Collectively, TLRs function to alert the immune system to the presence of microorganisms. Engagement of TLRs with their ligands leads to the production of various pro-inflammatory cytokines, chemokines, and effector molecules, depending on the cell type that is activated [33,34,35]. TLR knockout mice have been used to study the roles of TLRs in the immune response against different pathogens in vivo. For example, TLR2-deficient mice are highly susceptible to lethal infections with the sepsis-causing pathogen Staphylococcus aureus . In contrast, infections with Haemophilus influenzae or with RSV persist longer in the lungs of TLR4-deficient mice than in those of control animals [17,37]. Activation of signaling through TIR domains results in recruitment of the cytoplasmic adaptor proteins MyD88 and TOLLIP (Toll interacting protein)  (Figure 2). The IL-1 receptor-associated kinases IRAK-1 and IRAK-2 interact with the death domain of MyD88, a motif found in many apoptosis-inducing signaling molecules, and are recruited to the TLR complex. TOLLIP can also recruit IRAKs to the complex, albeit with different kinetics. Upon recruitment, IRAK-1 and IRAK-2 associate with TNF receptor-associated factor 6 (TRAF6), another adaptor protein. Very recently, two groups [39,40] have identified another serine-threonine kinase, termed IRAK-4, as an early component of the TLR-signaling cascade, possibly acting upstream of IRAK-1. TRAF6 induces activation of TGF-β-activated kinase (TAK1) and the mitogen-activated protein (MAP) kinase kinase MKK6, which, in turn, activate the transcription factor NF-κB, the c-Jun N-terminal kinase (JNK) and the p38 MAP kinase. The importance of MyD88 and TRAF6 in TLR signaling has been confirmed by targeted gene disruption. Homologs of many molecules involved in TLR signaling in mammals have been identified in Drosophila. TLR signal transduction pathways. All TLR proteins utilize the adapter protein MyD88 to activate a signaling pathway leading to the activation of MAP kinases and the transcription factor NF-κB in a TRAF-6-dependent manner. These signaling events culminate in expression of the pro-inflammatory cytokines IL-1β and TNF-α. TLR4 uses an additional adapter molecule, called TIRAP or Mal, to induce the expression of IL-6 and IFN-β. Via an autocrine/paracrine mechanism, IFN-β engages the type I IFN receptor (IFNAR), which leads to the activation of the Jak and Tyk kinases. These kinases phosphorylate the transcription factor STAT1 at tyrosine 701 and serine 727, thus allowing STAT1 to translocate to the nucleus. Nuclear STAT1, together with NF-κB, activates the STAT1-dependent genes inducible nitric oxide synthase (iNOS) and IFN-γ-inducible protein (IP-10). The + symbols indicate that the two contributing signal transduction pathways must be triggered concomitantly in order to get gene activation. An additional TLR4 signaling pathway was revealed through the observation that certain LPS-induced responses did not require MyD88 . Subsequently, two groups [39,40] identified a molecule called TIR domain-containing adapter protein (TIRAP) or MyD88-adapter-like (Mal), which interacts with TLR4 and mediates MyD88-independent TLR4 signaling. 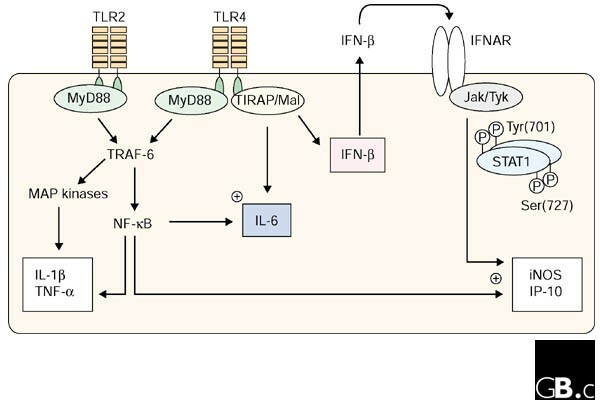 Although downstream components of this pathway remain to be identified, engagement of TLR4 with its ligand was recently shown to induce the secretion of the anti-viral interferon-β (IFN-β) via a TIRAP/Mal-dependent, but MyD88-independent, mechanism . Autocrine or paracrine production of IFN-β was also shown to be required for the expression of selected genes that could not be induced via engagement of TLR2, including inducible nitric oxide synthase (iNOS) or interferon inducible protein 10 (IP10; Figure 2). It is clear that engagement of TLRs activates a variety of inflammatory and innate immune responses in mammals. Ongoing efforts in many laboratories have led to the identification of TLR-specific signaling components and cellular responses, and more will be discovered in the future. It is also likely that TLRs work in combination with additional pattern-recognition receptors and co-receptors to add further diversity to their functions in vivo. How the host integrates the information that is signaled through TLRs and any co-receptors will ultimately control the progression of the immune response to pathogens. Understanding this process will undoubtedly lead to the development of novel therapeutics and immune adjuvants.